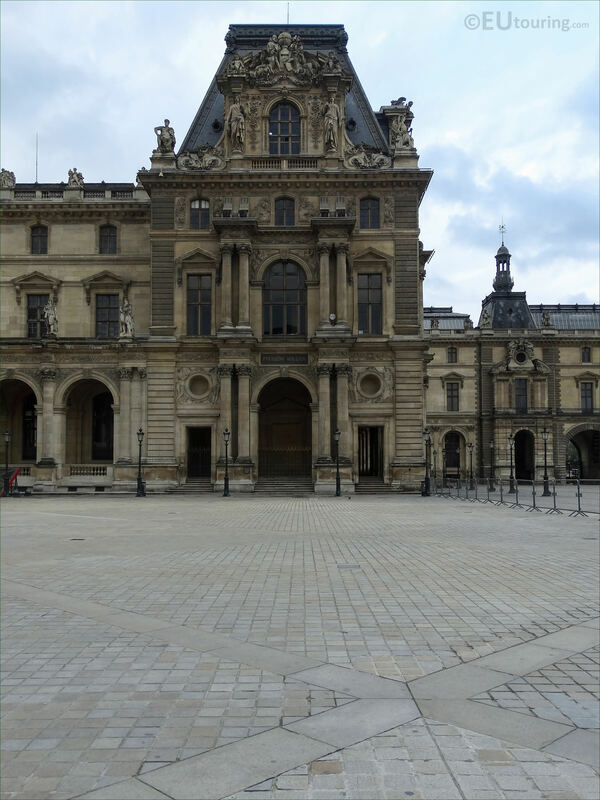 While we were in the 1st Arrondissement of Paris at the Musee du Louvre, we took these high definition photos showing a sculpture called La Geometrie et l’Astronomie, which was produced by Jean-Baptiste Klagmann. 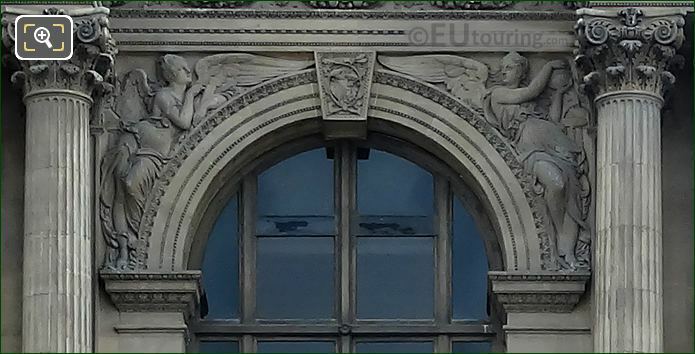 This first HD photo shows a sculpture decoration surrounding the top of a window on the Pavillon Moliien, called La Geometrie et l'Astronomie, which is a bas relief showing two winged female figures that represent Geometry to the left and Astronomy to the right. 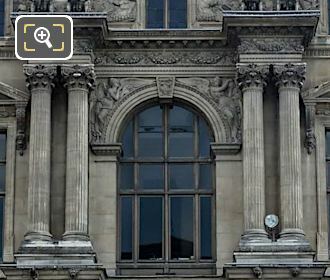 Now it was actually back in the 1850s during the restoration of the former Palais du Louvre that numerous artists were commissioned for different decorations to adorn the facades of this famous royal palace turned museum, and this particular one was sculpted by Jean-Baptiste Klagmann who was born in Paris in 1810 and studied at the Ecole des Beaux Arts becoming a sculptor decorator. 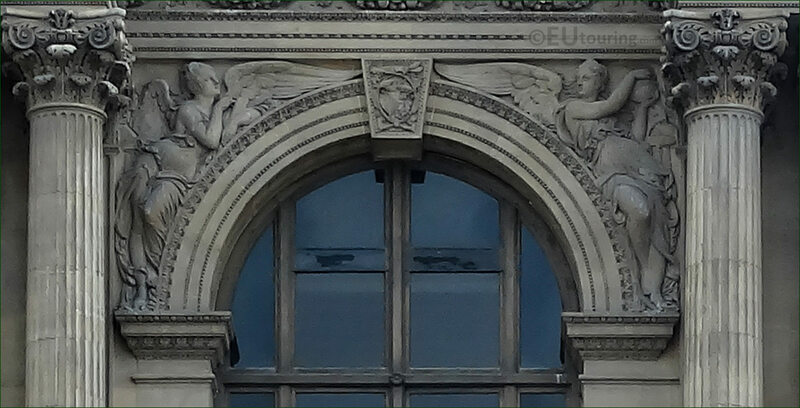 Jean-Baptiste Klagmann worked for different tourist attractions such as the Palais Royal, Comedie Francaise one of the series of Queens in the Jardin du Luxembourg, the restoration of the Fontaine de Leda and the sculptures on the Fontaine Louvois, plus of course this bas relief of Geometry and Astronomy on The Louvre. 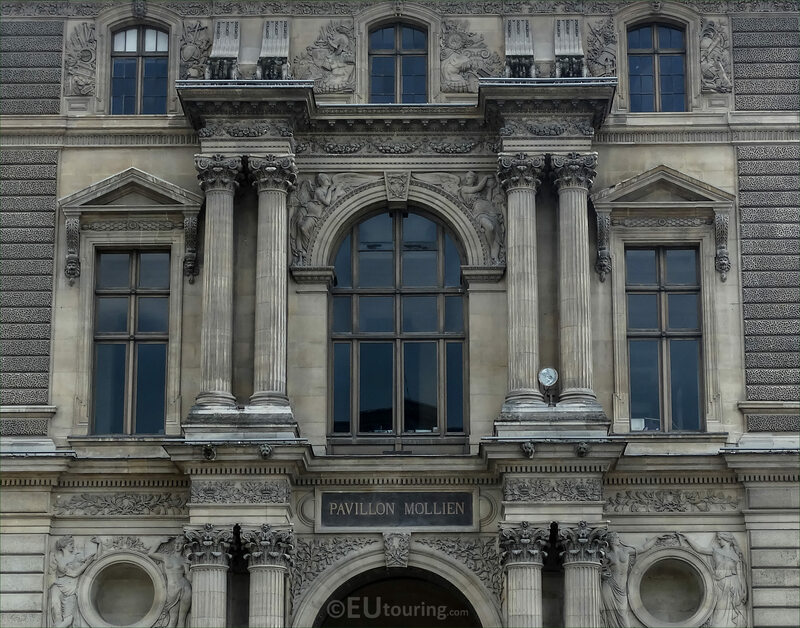 Yet this photograph show the entire northern facade of the Pavillon Mollien, which faces into the courtyard of the Louvre Museum called the Cour Napoleon, and you can see that La Geometrie et l'Astronomie sculpture is located on the second level above the central window in between the two columns either side.